To Cite: Yadollahi M, Zamani M, Jamali K, Mahmoudi A, Rasaee M A, et al. A Survey of Accidental Fall - induced Injuries and Mortality in a Central Trauma Hospital in Iran: 2015 - 2016, Trauma Mon. 2019 ; 24(2):e14285. doi: 10.5812/traumamon.14285. Background: The increasing rate of fall - induced trauma cases leads to an increase in mortality rates and lengthy hospital stay across the globe. The current study aimed at investigating the fall - related mortality in the age - group of 15 years and over. Methods: The current cross sectional study was conducted in 2016 on patients visiting Shahid Rajaee Hospital of Shiraz, Iran, for fall - induced injuries by census sampling method. The researchers completed a questionnaire including demographic data, accident type, and height of fall, duration of hospital stay, injured body regions, type of activity in time of accident, injury severity score, and death. Data were categorized and analyzed. Results: There were 544 subjects in the current study, with a mean age of 49.3 ± 22.42 years; 67% of the patients were male and 33% female, and 74.8% were married; the gender ratio was 2.02. There was no significant difference between the mean ages of injured females (59.15 ± 21.43 years) and males (44.43 ± 21.03 years) (P = 0.92). There was a significant relationship between injury site and fall - related mortality in the age group of 60 years and over (P = 0.02). Most cases of falls occurred during daily and occupational activities, mostly in the evenings. Around 54.2% of the injuries included multiple - organ injuries. Fall - induced injuries were more severe among the age group of 15 - 40 years and patients over 60 years old. Conclusions: According to the high mortality and severity of injuries in the more active age - group of the society (due to occupational activity), as well as the elderly, fall prevention plans seem a necessity among at risk groups. Injuries are major causes of mortality worldwide (1). In this regard, the highest level of injury pertains to cases of high energy blunt trauma, such as falls from heights and road - traffic accidents (2). Trauma due to falls increased in recent years and was the leading cause of non - fatal injuries and the third leading cause of fatal injuries in the U.S (3). According to numerous studies related to trauma in Iran, falls are the most common mechanism of injury after road crashes in this country (4-6). According to the 2010 report published by the global burden of disease study on fall - induced trauma 1990 - 2010, disability - adjusted life years were increased by more than 50% among such patients (7). The increasing rate of fall - induced trauma cases leads to an increase in mortality rates and lengths of hospital stay across the globe (8, 9); it is also the main cause of mortality in the age group of 65 years and over (10). Fall - induced trauma is of special significance due to the high - risk injuries involved (11). Age, gender, history of falls, weakness in lower extremities, impaired balance, psychedelic drug use, and arthritis are the leading risk factors for falls (12). Males and females experience falls to the same degree; however, females tend to get injured more often. Around 10% - 20% of the injuries include fractures, and most frequently hip fractures. Half of the elderly with fractured hips never return to their normal lives and experience certain levels of disability; about 20% of them pass away within a year. Head injuries, vertebral fractures, broken ribs, soft tissue injuries, and injuries to internal organs are all common types of fall - induced injuries (13, 14). The trauma caused by such incidents imposes heavy socioeconomic costs on the society, directly and indirectly (15). For this specific purpose, policy - makers and healthcare officials attempt to take preventive measures and put emergency plans into action in order to care for the victims. These policies lead to decreased mortality rates, overall recovery of severely injured patients, and reduction of socioeconomic burden in various countries (16, 17). To successfully implement preventive plans to reduce injuries and mortality rates further researches in the field are required. Primary prevention is the most effective way to reduce the burden of fall - induced injuries and death (18). According to the current study review of literature, most fall - related trauma studies are conducted among the elderly. Due to the high prevalence and significance of falls from heights, the current study aimed at discussing the fall types, time of accident, injury severity indices, and mortality rates among patients with fall - induced trauma of all age - groups visiting the emergency room in one year. The current descriptive, cross sectional study was conducted on 544 individuals in 2015. Population consisted of all patients with fall - induced trauma referred to the emergency ward of Shahid Rajaee Hospital, a trauma center in the Fars Province, Iran; sampling was conducted through census. Inclusion criteria were fall - induced trauma and age over 15 years. Cases with altered information, inaccessible clinical files, or imprecise patient history were excluded from the study. Data were collected for all subjects using a checklist consisting of demographic information, as well as data related to accident mechanism, trauma mechanism, level of acuity (triage), type of accident, duration of hospital stay, injured body regions based on abbreviated injury scale (AIS), type of activity, time of accident, injury severity score (ISS), and mortality. The injury severity score is an anatomical scoring system to evaluate patients with multiple injuries. The most severely injured body regions were determined and each corresponded to one of the six body regions (head, face, chest, abdomen, extremities, including pelvis, and external) defined by the AIS severity scale. Only the highest AIS score in each body region was used in the calculations. Then, the scores for the three most severely injured body regions were squared and added together to reach the ISS score; the ISS score range 1 - 75 (19). Data were categorized through descriptive statistics. The current study used the chi - square test and the Fisher exact test to compare qualitative variables between the two groups and quantitative variables were compared using t test; in cases where data distribution was not normal, a nonparametric alternative to t test (the Mann - Whitney U test) was used. P < 0.05 was determined as the significance level. Statistical Package for Social Sciences (SPSS) version 18 was used to analyze the data. There were 544 patients involved in the current study with the mean age of 49.3 ± 22.42 years, ranged 15 to 97. Table 1 presents the patients’ basic information. Of the patients under study, 66.9% were male, 33.1% female, and 74.8% were married; the gender ratio was 2.02. The age group of 15 - 40 years formed the main body portion of the current study population. An investigation of fall locations revealed that 52.6% of the falls occurred at the same level, 46% were falls from heights and 1.5% had unknown causes. Most referrals were determined as level - 3 patients in the triage; 45% of the patients were hospitalized for longer than 48 hours and 54.2% of the cases involved multiple - organ trauma. Overall, 76.3% of the patients were discharged and 8.8% of the fall cases led to death. There were no significant differences between the mean age of injured females (59.15 ± 21.43 years) and males (44.43 ± 21.03 years) (P = 0.92). Most injured individuals were over 60 years old. The current study data showed that most incidents happened during daily and occupational activities. The statistical tests indicated a significant association between the type of activity and fall mechanism (P = 0.04). Falls mostly occurred from 12:00 PM to 6:00 PM. Mean ISS was 6.74 ± 8.24 years, hospital stay of longer than 48 hours had the highest frequency, and there was a significant relationship between gender and type of fall (P < 0.001). Males experienced more falls compared with females; 83.3% of the females had same-level falls and 61% of the males had falls from heights. Table 2 addresses the relationship between mortality and the variables under study, categorized by the two age groups of over and under 60 years. These findings showed a significant relationship between injury site and mortality in the over 60 years age group (P = 0.02). Overall, fall - induced mortality was 8.8% in the current study. The Fisher exact test showed no significant relationships between mortality and gender (P = 0.54). Although there was no obvious significant difference between mortality rates of females and males (8.7% among males and 8.8 % among females), there were some differences in terms of age group (Figure 1). The highest rate in mortality related to males was in the age group of 40 - 60 years. According to the current study data, 71.8% of the patients aged 15 - 40 years experienced falling from heights, while in the age group of 40 - 60 years, 59.4% of the patients had same - level falls; among the elderly (> 60 years old), nearly all patients experienced simple falls. 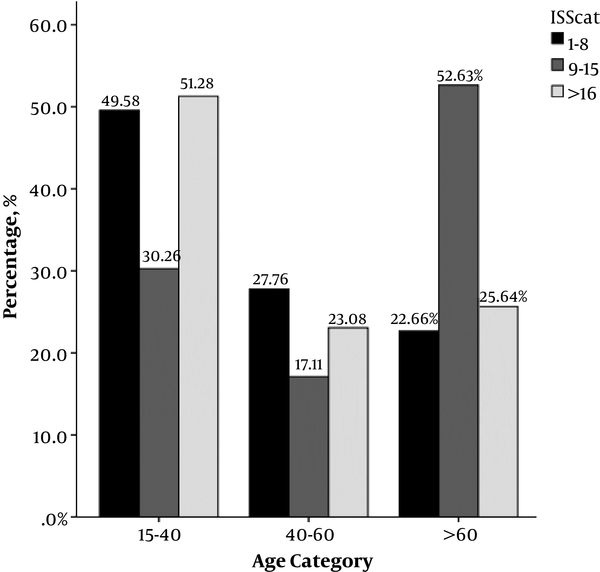 Figure 2 shows that 52.3% of the patients over 60 years had an ISS of 9 - 15. The elderly were mostly injured due to same - level falls. Meanwhile, in the age group of 15 - 40, 51.28% had an ISS of over 16; the high severity of injuries in this age group was the result of falls from heights. The most severe injuries were witnessed in these two age groups. There was significant association between the type of elevated falls and duration of hospital stay (P < 0.001); results also revealed that individuals fallen from heights had the longest periods of hospitalization (over 48 hours). A review of mean age among survivors (49.02 ± 22.26 years) and the deceased (52.20 ± 24.04 years) showed a significant difference between the two groups (P < 0.001); individuals over 60 years had the highest rate of mortality in the current study. The current study indicated a fall-induced mortality of 8.8%, while this rate was reported as 9.6% by the World Health Organization (WHO) in 2008. Even with increased age, males still have a higher fall - induced mortality rate comparing with females (20); according to the current study findings, overall mortality was about the same among males and females. Meanwhile, there was an increasing rate of fall - induced mortality among females as age increased. The mortality rate diagram showed a significant increase among 40- to 60 - year - old males; this could be due to the low number of referrals in this age group, which can result in a high mortality rate. Individuals over 60 years had the highest mortality in the current study, which was consistent with the results obtained by Adam and Akkose Ayedin (21, 22). Afzal Aghaee et al. (23), showed no significant differences between gender and fall - related mortality; the results were consistent with the current study findings. In a study by Giandos (24) on the prevalence and mortality of trauma among the elderly, injuries to the head, chest, abdomen, and spine significantly increased the mortality rate. Results of the current study revealed a significant association between mortality and injured body region. Most cases of falls belonged to males in the 15 - 40 years age group; among females, the age group of 60 years and above had the highest incidence of falling. The current study showed that fall - related referrals mostly consisted of males. A study by Zargar et al., on urban traumatic injuries reported males as the most vulnerable group. This study also mentioned the high prevalence of trauma due to motor - vehicle accidents and falls from heights (25). Occupation is identified as the reason behind this high incidence of falls among males, which can be justified considering the social, cultural, and economic conditions of Iran community (most females being housewives and the higher involvement of males in the transportation sector). The traumatic patients under study had the mean age of 49 years. Now, since the age group 15 - 40 years had the highest frequency, it can be concluded that most victims were of working age. Most Iranian studies provided similar results (26, 27). In the current study, hospital stay of longer than 48 hours and same - level falls both had the highest frequency. In the meantime, males mostly had falls from heights, while females mostly experienced same - level falls. Previous studies pointed to the osteoporosis caused by hormonal changes following menopause as the reason behind falls among elderly females (28, 29). Therefore, it is of special importance to detect osteoporosis in the elderly, especially females (30, 31). Falls mostly occurred during daily or occupational activities and in the evening hours. The WHO identified dangerous high - altitude jobs, low mobility (especially in the elderly), lack of balance, chronic diseases, neurological disabilities, and socioeconomic conditions as the risk factors for falls (20). Lower extremities were the most common anatomic sites for fall - induced injuries, followed by head - and - neck region; a finding consistent with the results presented by Aghaee et al. (27). The height of a fall and the distance to the ground would determine the severity of injuries in a victim (32). In the current study, 52.6% of the elderly had an ISS of 9 - 15; in addition, 51.28% of the working group had an ISS > 16, and for 49.58% of them ISS was 0 - 8. Due to physical disability and arthritis, the elderly experienced serious injuries in same - level falls, while in the age group (15 - 40 years), severe injuries were mostly caused by falling from heights during occupational activities due to lack of workplace safety. Careful assessments should be made regarding fall prevention plans to protect workers in the construction industry (33). In a study by Sterling et al., 512 patients with fall - induced trauma were evaluated. A total of 333 patients were over 65 years old and 1179 patients were in the younger age groups; 65% of the elderly and 11% of the youth had ISS > 15. The lower rate of young individuals with serious injuries in that study could be due to the proper workplace safety in their society (34). Previous studies on falls mostly included the elderly, which is a different case in the current study. The current study focused on an age-specific evaluation of fall - induced trauma in patients of all age groups. For further research, it is suggested to conduct epidemiological studies with consideration to different variables affecting patient outcomes, as well as body mass index (BMI) and its influence on injury severity. According to the current study results, fall - induced injuries were a significant safety and health issue for adults in all ages. The variable of age was the determining factor for severity of injuries and mechanism of falls. Injuries were more severe in the more active age - group of the society (15 - 40 years) due to occupational activities; the elderly (60 years and above) experienced severe injuries as well. Therefore, it is essential to design preventive plans and strategies in order to reduce the risk of falls, as well as the mortality associated with them, in the more vulnerable groups of society; it is also important to pay attention to the safety of houses and streets for the elderly and provide a safe work environment for workers in the construction industry. The current article was extracted from the thesis by Mohammad Ali Rasaiee under the supervision of Drs. Mahnaz Yadollahi and Kazem Jamali. Funding/Support: The study was financially supported by Shiraz University of Medical Sciences (Grant No. : 93 - 01 - 38 - 8748). Conflict of Interests: It was not declared by the authors. 1. Gosselin RA, Spiegel DA, Coughlin R, Zirkle LG. Injuries: the neglected burden in developing countries. Bull World Health Organ. 2009;87(4):246-246a. [PubMed: 19551225]. [PubMed Central: PMC2672580]. 2. Ong A, Iau PT, Yeo AW, Koh MP, Lau G. Victims of falls from a height surviving to hospital admission in two Singapore hospitals. Med Sci Law. 2004;44(3):201-6. doi: 10.1258/rsmmsl.44.3.201. [PubMed: 15296242]. 3. Sise RG, Calvo RY, Spain DA, Weiser TG, Staudenmayer KL. The epidemiology of trauma-related mortality in the United States from 2002 to 2010. J Trauma Acute Care Surg. 2014;76(4):913-9. discussion 920. doi: 10.1097/TA.0000000000000169. [PubMed: 24662852]. 4. Yadollahi M, Anvar M, Ghaem H, Bolandparvaz S, Paydar S, Izianloo F. Logistic regression modeling for evaluation of factors affecting trauma outcome in a level I trauma center in Shiraz. Iran Red Crescent Med J. 2017;19(1). 5. Karbakhsh M, Zandi NS, Rouzrokh M, Zarei MR. Injury epidemiology in Kermanshah: the National Trauma Project in Islamic Republic of Iran. East Mediterr Health J. 2009;15(1):57-64. [PubMed: 19469427]. 6. Hemmati H, Yousefzadeh Chabok S, Dehnadimoghadam A, Mohammadi Melksari H, Ahmadi Dafchahi M, Shabani S. Trauma in Guilan (North of Iran): an epidemiologic study. Acta Medica Iranica. 2009;47(5):403-8. 7. Murray CJ, Atkinson C, Bhalla K, Birbeck G, Burstein R, Chou D, et al. The state of US health, 1990-2010: burden of diseases, injuries, and risk factors. JAMA. 2013;310(6):591-608. doi: 10.1001/jama.2013.13805. [PubMed: 23842577]. [PubMed Central: PMC5436627]. 8. Curry P, Ramaiah R, Vavilala MS. Current trends and update on injury prevention. Int J Crit Illn Inj Sci. 2011;1(1):57-65. doi: 10.4103/2229-5151.79283. [PubMed: 22096775]. [PubMed Central: PMC3209994]. 9. Orces CH. Trends in fall-related mortality among older adults in Texas. Tex Med. 2008;104(5):55-9. [PubMed: 18683523]. 10. Roudsari BS, Ebel BE, Corso PS, Molinari NA, Koepsell TD. The acute medical care costs of fall-related injuries among the U.S. older adults. Injury. 2005;36(11):1316-22. doi: 10.1016/j.injury.2005.05.024. [PubMed: 16214476]. 11. Spritzer DZ, Volpini LM, Meireles da Costa JHC, Filho M. A Evaluation of ocular trauma related to falling in elderly patients. Rev Bras Oftalmol. 2016;75(1):21-5. doi: 10.5935/0034-7280.20160005. 12. So young K, Woojin B, Min-su K, Bumjung P, Jin-hwan K, Hyo geun C. Nocturia is associated with slipping and fall. Plos one. 2017. doi: 10.1371/journal.pone.0169690. 13. Nilson F, Moniruzzaman S, Andersson R. Fall-related fracture trends among elderly in Sweden--exoring transitions among hospitalized cases. J Safety Res. 2013;45:141-5. doi: 10.1016/j.jsr.2012.10.014. [PubMed: 23708486]. 14. Scandol JP, Toson B, Close JC. Fall-related hip fracture hospitalisations and the prevalence of dementia within older people in New South Wales, Australia: an analysis of linked data. Injury. 2013;44(6):776-83. doi: 10.1016/j.injury.2012.11.023. [PubMed: 23270698]. 15. Mackersie RC. Field triage, and the fragile supply of "optimal resources" for the care of the injured patient. Prehosp Emerg Care. 2006;10(3):347-50. doi: 10.1080/10903120600728920. [PubMed: 16801277]. 16. Mock CN, Jurkovich GJ, nii-Amon-Kotei D, Arreola-Risa C, Maier RV. Trauma Mortality Patterns in Three Nations at Different Economic Levels. J Trauma Inj Infect Crit Care. 1998;44(5):804-14. doi: 10.1097/00005373-199805000-00011. 17. Schuur JD, Hsia RY, Burstin H, Schull MJ, Pines JM. Quality measurement in the emergency department: past and future. Health Aff (Millwood). 2013;32(12):2129-38. doi: 10.1377/hlthaff.2013.0730. [PubMed: 24301396]. 18. Gillespie LD, Robertson MC, Gillespie WJ, Sherrington C, Gates S, Clemson LM, et al. Interventions for preventing falls in older people living in the community. Cochrane Database Syst Rev. 2012;(9). CD007146. doi: 10.1002/14651858.CD007146.pub3. [PubMed: 22972103]. 19. Pohlman TH, Bjerke HS, Offner P. Trauma scoring systems. 2017, [cited Nov 9]. Available from: http://emedicine.medscape.com/article/434076-overview. 20. Ageing WHO. WHO global report on falls prevention in older age. World Health Organization. 2008. 21. Adam SH, Eid HO, Barss P, Lunsjo K, Grivna M, Torab FC, et al. 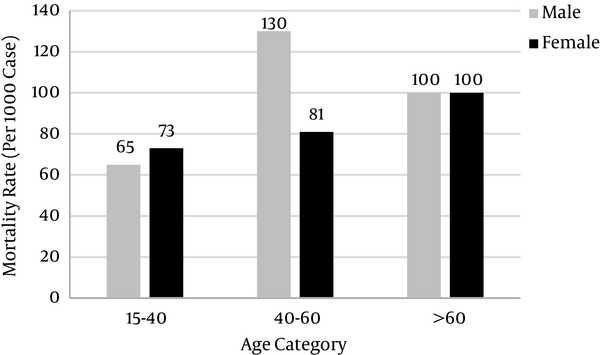 Epidemiology of geriatric trauma in United Arab Emirates. Arch Gerontol Geriatr. 2008;47(3):377-82. doi: 10.1016/j.archger.2007.08.018. [PubMed: 17936381]. 22. Akkose Aydyn P, Bulut M, Fedakar R, Ozgurer A, Ozdemir F. Trauma in the elderly patients in Bursa. Ulus Travma Acil Cerrahi Derg. 2006;12(3):230-4. 23. Afzal Aghaee M, Norouzi S, Mousavi MS, Khorsand Vakilzadeh A. [Traumatic Injuries Caused by Fall in the Elderly Referred to the Emergency Department; An Epidemiologic Study]. Iranian Journal of Emergency Medicine. 2016;3(3):109-14. Persian. 24. Giannoudis PV, Harwood PJ, Court-Brown C, Pape HC. Severe and multiple trauma in older patients; incidence and mortality. Injury. 2009;40(4):362-7. doi: 10.1016/j.injury.2008.10.016. [PubMed: 19217104]. 25. Zargar M, Modaghegh MS, Rezaishiraz H. Urban injuries in Tehran: demography of trauma patients and evaluation of trauma care. Injury. 2001;32(8):613-7. doi: 10.1016/s0020-1383(01)00029-8. 26. Yousefzadeh S, Ahmadi Dafchahi M, Mohammadi Maleksari H, Dehnadi Moghadam A, Hemati H, Shabani S. [Epidemiology of injuries and their cause among traumatic patients admitted in to poursina hospital Rasht]. J Kermanshah Univ Med Sci. 2007;11(3):286-95. Persian. 27. Farzandipour M, Ghattan H, Mazrouei L, Nejati M, Aghabagheri T. [Epidemiological study of traumatic patients referred to neghavi hospital of Kashan]. J Kermanshah Univ Med Sci. 2007;11(1):58-68. Persian. 28. Alamgir H, Muazzam S, Nasrullah M. Unintentional falls mortality among elderly in the United States: time for action. Injury. 2012;43(12):2065-71. doi: 10.1016/j.injury.2011.12.001. [PubMed: 22265137]. 29. Orces CH, Alamgir H. Trends in fall-related injuries among older adults treated in emergency departments in the USA. Inj Prev. 2014;20(6):421-3. doi: 10.1136/injuryprev-2014-041268. [PubMed: 24916685]. 30. Walker-Bone K. Preventing fractures in the elderly. Br J Hosp Med (Lond). 2011;72(10):576-81. [PubMed: 22041728]. 31. Randell A, Sambrook PN, Nguyen TV, Lapsley H, Jones G, Kelly PJ, et al. Direct clinical and welfare costs of osteoporotic fractures in elderly men and women. Osteoporos Int. 1995;5(6):427-32. [PubMed: 8695963]. 32. Behera C, Rautji R, Dogra TD. Fatal accidental fall from height in infants and children: a study from South Delhi. Med Sci Law. 2010;50(1):22-4. doi: 10.1258/msl.2009.009010. [PubMed: 20349690]. 33. Chen H, Luo X. Severity prediction models of falling risk for workers at height. Proc Eng. 2016;164:439-45. 34. Sterling DA, O'Connor JA, Bonadies J. Geriatric falls: injury severity is high and disproportionate to mechanism. J Trauma. 2001;50(1):116-9. [PubMed: 11231681].